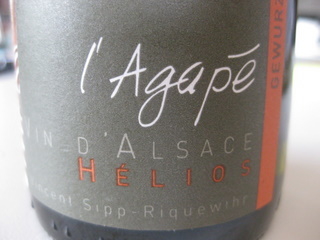 Vincent Sipp left the family winery Sipp-Mack in Hunawihr in 2007 and set up shop on his own at Domaine Agapé on the edge of the village of Riquewihr. According to my dictionary, the word agape means variously: ‘a state of wonder or amazement’, or ‘love’ or even ‘a meal celebrated as a sign of love’. And according to Vincent’s delightful helpmate who welcomed us, all of the above are included in the concept of the domaine’s wines. I rather like the suggestion that they’re set to a) knock your socks off, b) seduce you and c) make a loving match with food. The domaine consists of around 9 hectares of vines, around a third of them in Grands Crus in Riquewihr, Ribeauvillé and Hunawihr (Schoenenbourg, Osterberg and Rosacker respectively). They make 50-55,000 bottles p.a., and do a brisk business in Belgium and Denmark (the Danes are good clients of Alsace and its wines – no wonder my book Alsace Gastronomique went into a Danish edition). This is a small, simple and delightfully informal winery – perched on a bench in the cellar/despatch room we worked our way through 12 wines, from a pale straw, aromatic, fruity/dry Pinot Blanc Auxerrois Expression (€7) right up to a sublime, silky, long-lasting ’07 Gewurz Sélection de Grains Nobles (check the website for the price, it’s not made every year). In all, an admirably coherent range of straight, upright, clean-as-a-whistle wines. There’s a helpful dryness indicator on the back label in the form of a pictogram numbered 1-6 (1 being dry and 6 sweet). Entry-level wines are labelled Expression, Grands Crus are given full credit and late-harvested are labelled Helios, on account of all that sunny ripeness. STOP PRESS: Eric Asimov in The Pour (New York Times Dining & Wine) recently recommended Domaine Agapé’s Crémant, Émotion, which retails in the US for about $20.